Use our Poland email list to let locals in this powerful European market know about your brand's products or services. We have Polish business contacts readily available in our human-verified, accurate email database, which is ready for you to download. With the largest economy in central Europe, Poland is full of high-quality business contacts in numerous fields and the types of professionals who are often interested in building strong B2B relationships. Numerous manufacturing industries are important in this country, and with our list-builder tool, you can customize your Polish mailing list even further to find only those within the industry or job title that's most relevant to you. This ready-made email database of Polish contacts, however, is one of our bulk email lists pulled by country. It's a huge directory that contains tons of contacts and is especially useful to those hoping to do multiple B2B marketing campaigns in Poland. Find useful contacts so that you can build your business in Warsaw one day and then network with locals in Kraków the next. 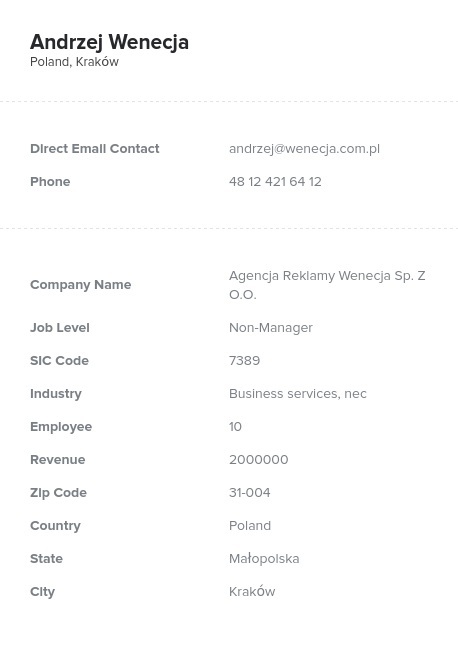 This one list has everything you'd need to make a sale; it's a Polish business database that's not limited to only emails but also contains postal addresses, phone numbers, company information, job titles, and real names. Buy our Poland mailing list and start emailing sales leads right away, or create your own solution with the custom list-builder tool. Bookyourdata.com can bring you the exact, localized, targeted email list for Poland that you need. Try it today and see how easy it is to make local sales in Poland!